Williamson denied Nazis intentionally murdered 6 million Jews. ROME, Italy (CNN) -- The Vatican says it has ordered a controversial bishop who denies the Holocaust to "distance himself" from his views "in an absolutely unequivocal and public manner." In the interview, Bishop Williamson denied the Nazis had used gas chambers at concentration camps. The Vatican has been under fire since Pope Benedict XVI lifted the excommunication of Bishop Richard Williamson almost two weeks ago, days after Swedish Public Television broadcast an interview in which Williamson said the Nazis had not systematically murdered 6 million Jews during World War II. Israel Wednesday blasted the rehabilitation of Williamson. "The reinstatement of a Holocaust denier by the Holy See offends every Jew, in Israel and around the world, and humiliates the memory of all Holocaust victims and survivors," the Ministry of Foreign Affairs said in a statement. It said the Church's distancing itself from Williamson's position was "the first step in the right direction" and said it expected "more explicit and unequivocal decisions and statements on this issue." Israel's statement appears to have been made before the Vatican's secretary of state, Cardinal Tarcisio Bertone, said Williamson would not be allowed to perform priestly functions if he did not recant. Williamson's position on the Holocaust is "absolutely unacceptable and firmly rejected by the Pope," Bertone said. He added that Williamson's views on the Holocaust "were unknown to the Holy Father at the time of the excommunication's remission." Williamson was rehabilitated on January 21 along with three other members of the ultra-conservative Society of Saint Pius X. The move was announced three days later. Bertone's order comes only two days after he declared the matter "closed." "The Society of Saint Pius X has distanced itself from its bishop and apologized to the pope for this embarrassing incident. The pope spoke clearly on Wednesday (January 28). I think the question can be considered closed," Bertone, said, according the Catholic daily Avvenire Tuesday. But on Tuesday, German Chancellor Angela Merkel demanded that the pope firmly reject denial of the Holocaust. Earlier on Wednesday, a German district attorney said he had launched a criminal investigation into Williamson's remarks. "I believe that the historical evidence is strongly against -- is hugely against -- 6 million Jews having been deliberately gassed in gas chambers as a deliberate policy of Adolf Hitler," Williamson said in the Swedish interview, which also appeared on various Web sites after broadcast. "I believe there were no gas chambers." Regensburg District Attorney Guenther Ruckdaeschel said authorities were investigating whether the remarks can be considered "inciting racial hatred." Denying the Holocaust is a crime in Germany, punishable by up to five years in prison. American Jewish leaders have also expressed outrage that Williamson, who was excommunicated in 1988, was welcomed back to the church days after the interview. Williamson and three other bishops who belong to the Society of Saint Pius X were excommunicated by Pope John Paul II in 1988. The society was founded by Archbishop Marcel Lefebrve, who rebelled against the Vatican's modernizing reforms in the 1960s, and who consecrated the men in unsanctioned ceremonies. 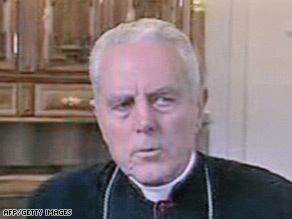 Vatican spokesman Father Federico Lombardi said when the controversy erupted that the Vatican's decision to accept Williamson was part of its desire to normalize relations with the ultra-conservative group, and had nothing to do with the bishop's personal views. Ruckdaeschel decided to launch his investigation in Regensburg because the Williamson interview was conducted at a seminar of the Society of Saint Pius X, of which Williamson is a member, in the nearby town of Zaitzkofen. Ruckdaeschel told CNN that a legal representative for Williamson contacted him and said the bishop denied the allegations. Williamson apologized last week for the "distress" his remarks caused the pope, but did not retract them. According to the legal representative's account, Williamson had told the Swedish reporters he did not want the interview aired outside Sweden -- and therefore, the remarks would not fall under German criminal law. According to the German criminal code, comments glorifying or denying crimes committed by the Nazis, or National Socialists, are a crime only if they are made publicly. Ruckdaeschel says he will attempt to question the two Swedish reporters who conducted the interview. He said it was unlikely Williamson would have to appear in court because he is currently in Argentina, but the bishop may be required to submit a written statement in the case. The pope -- who was born in Germany and was a child during the Nazi period -- rejected Holocaust denial in public statements on January 28. After his 14th birthday in 1941, Benedict -- then called Joseph Ratzinger -- was forced along with the rest of his class in Bavaria, southern Germany, to join the Hitler Youth. However his biographer John Allen Jr., said Ratzinger's family was strongly anti-Nazi. CNN's Hada Messia and Alessio Vinci in Rome and Frederik Pleitgen in Berlin contributed to this report.